I've been canning a wide variety of fruits, jams, purees, sauces, soups, etc. for my family for the past 25+ years. Every year...I try to process more than I did the previous year so that we have a well-stocked pantry through the Fall, Winter and Spring months. Two weeks ago I got a fabulous deal on Freestone Peaches at my local orchard & farmer's market. I ended up buying a few bushels so that I could can them. When I can my peaches...I always follow the recipe in the Ball Blue Book - Guiding to Preserving. I opt to make them in light syrup and I do the Raw Pack method. The recipe will make 6 pint or 3 quart jars. Prep: Wash peaches under cold running water; drain. To peel the peaches, blanch them in boiling water for 30 to 60 seconds, transfer to cold water. Peel them and remove the pit by cutting peaches in half lengthwise. Treat with Fruit-Fresh to prevent darkening. Cook: Prepare syrup for canning (see below) in a medium saucepan. Bring mixture to a boil. Reduce heat to a simmer. Drain peaches. 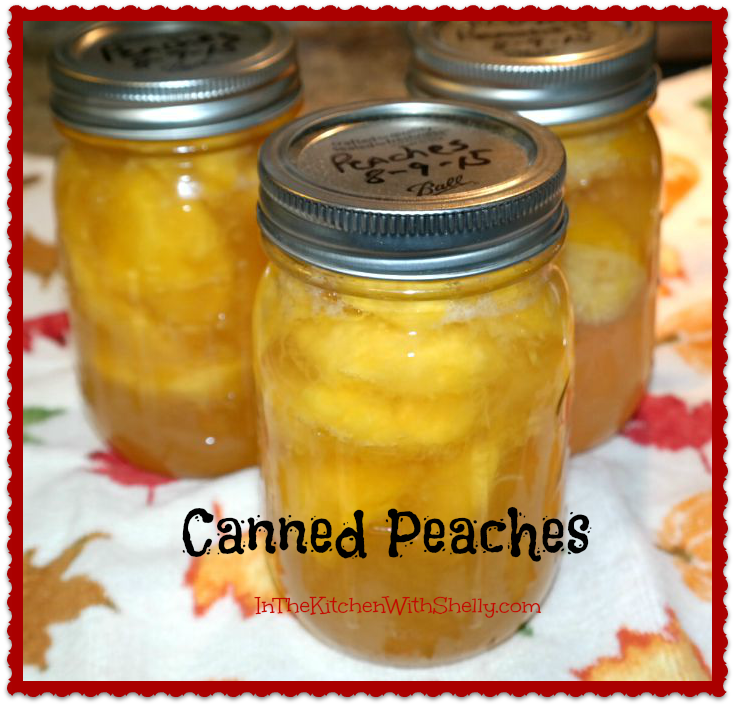 Fill: Pack peaches, cavity side down and in layers, overlapping one another into a hot canning jar. Ladle hot syrup over the peaches leaving a 1/2" headspace. Remove air bubbles, wipe the rims clean. Apply the seal and tighten the band so that it's finger-tip tight. Place jar into the wire rack of your water bath canner that has simmering hot water in it. Continue until all jars are filled. Process: Lower the rack into the simmering hot water. Make sure water is covering the top of the jars by at least 1". Adjust heat to medium-high, cover the canner and bring the water to a boil. Process the pint jars for 25 minutes or the quart jars for 30 minutes. Turn off the heat and let jars sit for 5 minutes in the hot water. Lift up the wire basket and remove jars to let them cool. After 12 hours make sure that all of your jars have sealed properly. To make syrup mix together the granulated sugar with water in a medium saucepan over medium heat until all of the granulated sugar has dissolved. * Each syrup batch yields enough syrup to can 3 to 4 quart jars of fruit. You are giving me more and more canning recipes and I need to start trying them. I love peaches.